I love fresh figs. I love the smell of them when they are on the trees. It smells like coconut sun cream when I run past them with the dog. Like Hawaian Tropic. I also think Jo Malone’s perfume, Wild Fig & Cassis, smells like coconut too. That’s my favourite summer fragrance, in case you were wondering. Which you weren’t. That and Clarins Eau Dynamisante. So back to figs. That actually may be the smell of them rotting on the ground. 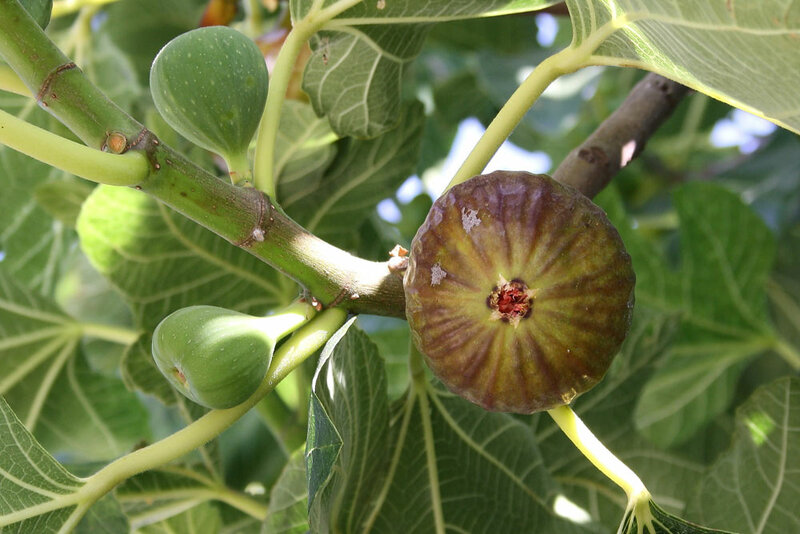 That’s the thing with fig trees, you always end up with a glut of figs. We are coming to the end of the early season figs here at the moment called “Brevas”. They are larger and darker coloured whereas the later season ones “Higos”, that are starting to ripen now, are smaller and light green. So what do you do with a mountain of fresh figs? I do have a lot of recipes using fresh figs like this Fiery Fig Chutney, this Fresh Fig & Goats Cheese Quiche, and this Fresh Fig & Almond Ice Cream. 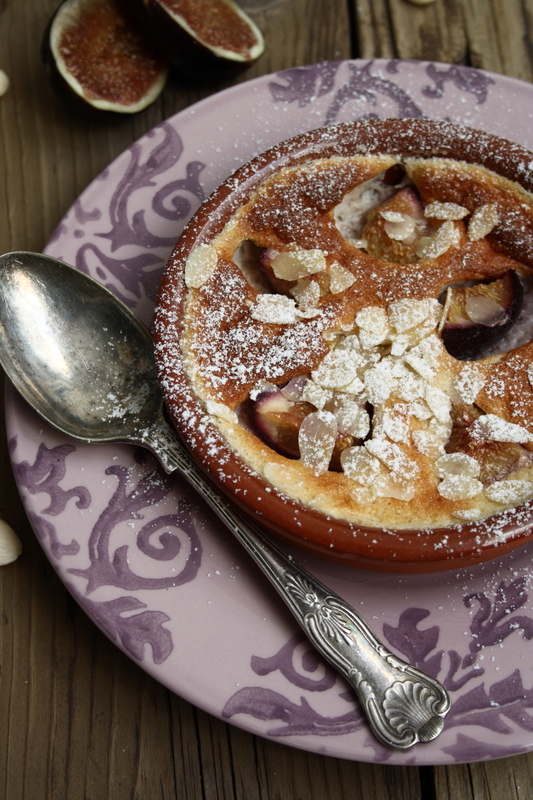 But my favourite at the moment is this clafoutis. It’s quick, easy and not at all bad for you really. Amaretto aside, of course. But a world without Amaretto would be a much sadder place don’t you think? Preheat oven to 180C and oil & flour your tins or terracotta dishes. Separate the yolks and the whites into 2 bowls. Whisk the yolks and honey until pale and creamy. Gently fold in the flour & ground almonds and stir in the yoghurt, essences, amaretto, salt & orange zest. With an electric whisk, whisk the egg whites until firm and fluffy like meringue. Add a little of the whites to the other mixture to loosen it then carefully fold in the rest of the whites trying not top deflate them too much. When the white is incorporated into the rest, pour the mixture into the prepared dishes and top with the pieces of fig. 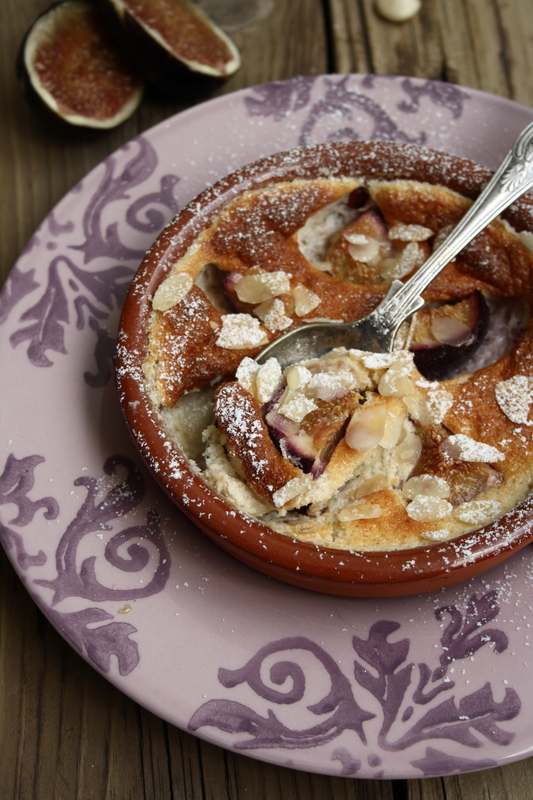 Bake for about 15 minutes then scatter over a few flaked almonds and bake for another 5 minutes until cooked. Longer for a large clafoutis. 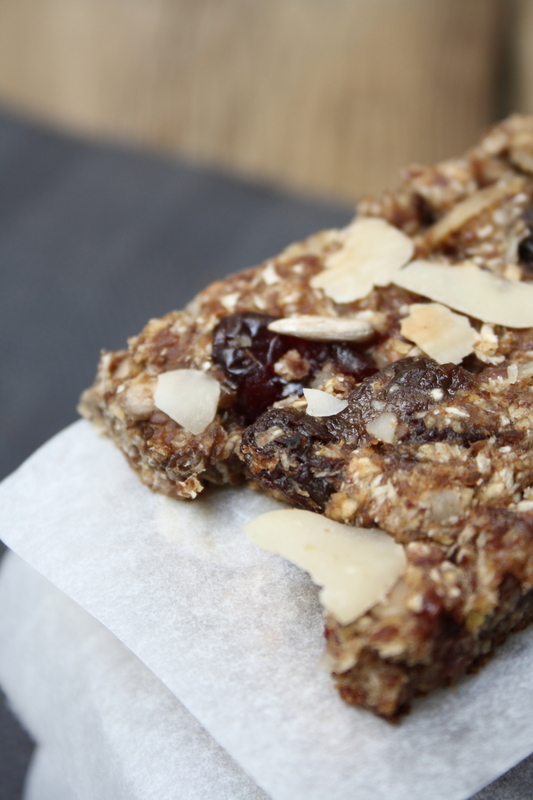 This is the next recipe in my Sweet & Healthy series. 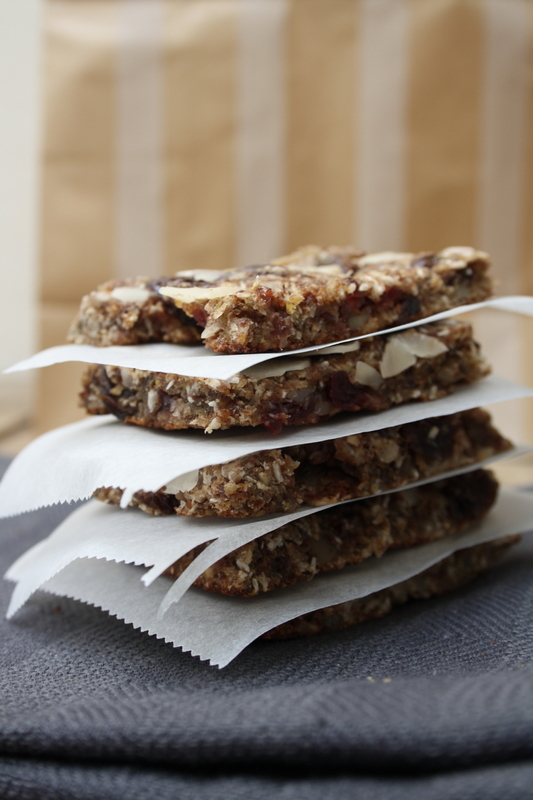 I used to buy muesli bars all the time, I took them to work and college to snack on in the afternoon, you know when you get that craving for something sweet. The companies that make these spend millions on packaging and marketing to make you believe that they are the healthy alternative and are actually good for you. Nearly all of them are packed with sugar and oil or butter so that any goodness you might be getting from the fruit, seeds and nuts is completely irrelevant. You might as well buy a toffee apple with a side order of candy floss. Making your own is really quick and easy, you have complete control over what goes in them and you aren’t paying for fake organic looking packaging and advertising campaigns with sunny farms in them. If you don’t like raisins leave them out, prefer hazelnuts to almonds then put them in instead. Preheat the oven to 175C and line a baking sheet with baking paper brushed with a little oil. Put the chopped banana, oats, coconut, vanilla, flaxmeal, cinnamon and honey in a food processor and pulse together slowly. Add the milk a tablespoon at a time until it comes together. Add in the rest of the ingredients and pulse together again. You can blend it really well or leave some bits chunky. Tip the mixture out onto the lined baking sheet and shape it into a flat, even square about 1/2 cm thick with a spatula. It takes a bit of time & patience to make it even but they will be easier to cut into squares or rectangles later. 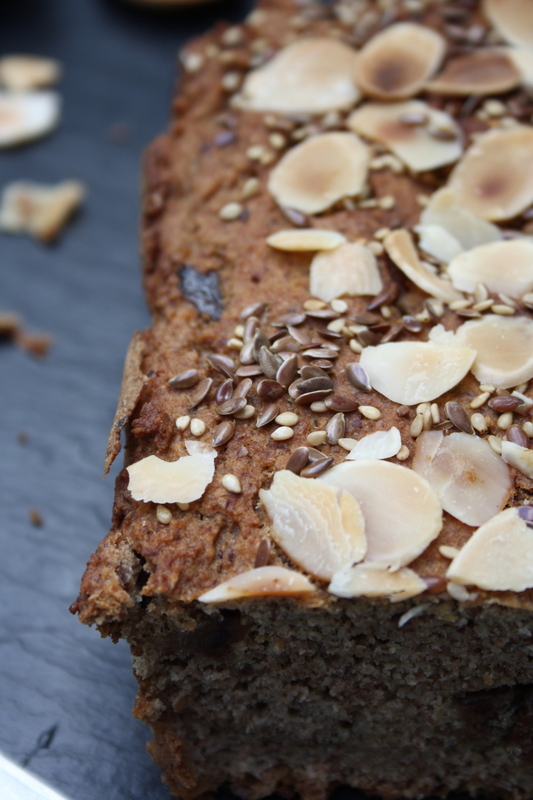 Top with a few more flaked almonds and sunflower seeds and press them down a bit. Bake for 11-13 minutes until the edges are just starting to brown. Cut into 12 squares or 8 rectangles while still warm. Leave to cool and store in an airtight container. 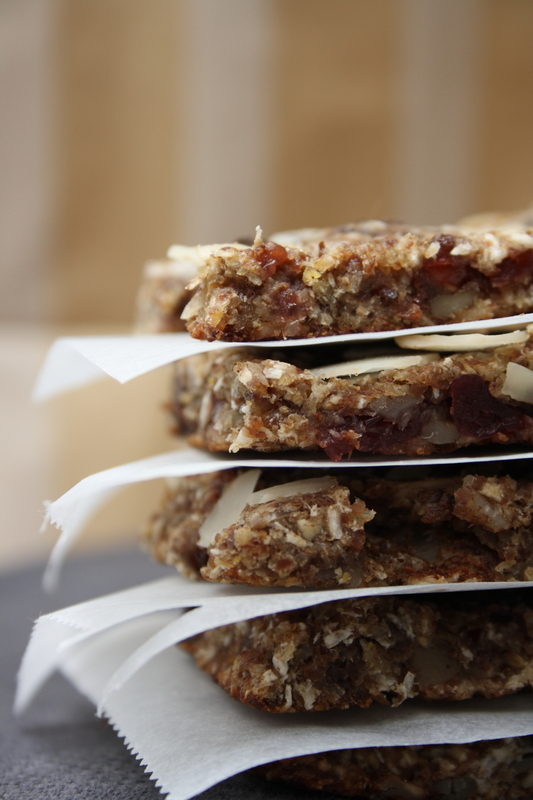 All of these recipes use wholemeal spelt flour or ground almonds rather than processed flours. We use coconut oil or olive oil instead of butter and use honey, maple syrup or miel de cana instead of refined sugars. 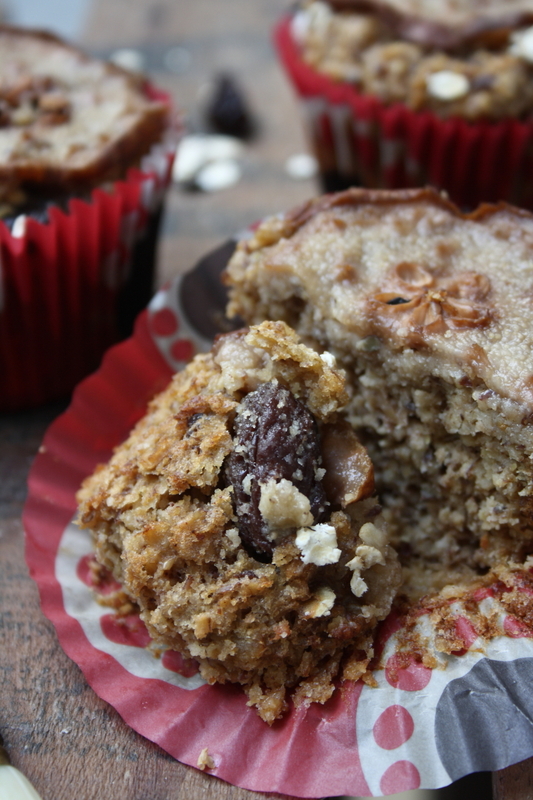 This is the next recipe from my Sweet & Healthy series that I didn’t realise I was doing until I just looked at all the recipes and photos I had waiting to publish and noticed that they were all sweet treats that are good for you. 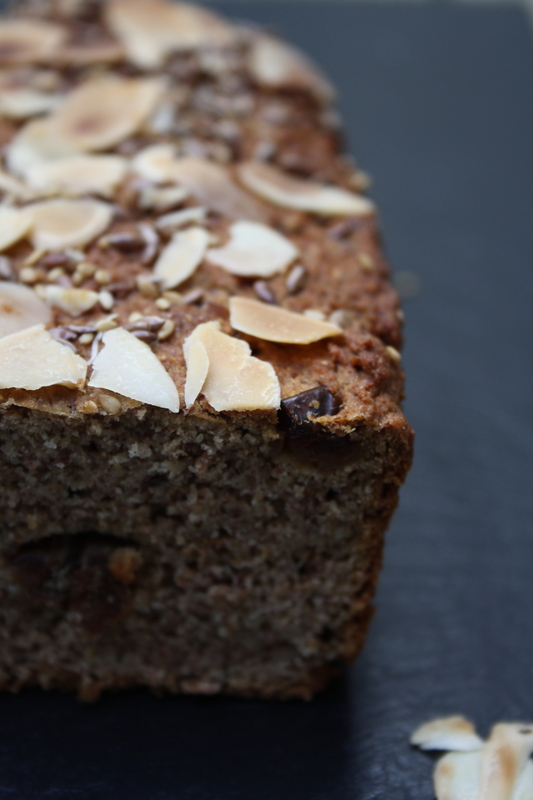 The previous recipe in the (now) series was for this Vegan Banana Bread with Dates & Almonds. This is because The Washer Up likes something sweet to take to work with his lunch and I always end up snacking on whatever it is too, so it has to be healthy. These are brilliant for breakfast if you don’t have time to make anything and terrific for that afternoon tea break when you need a sweet fix. 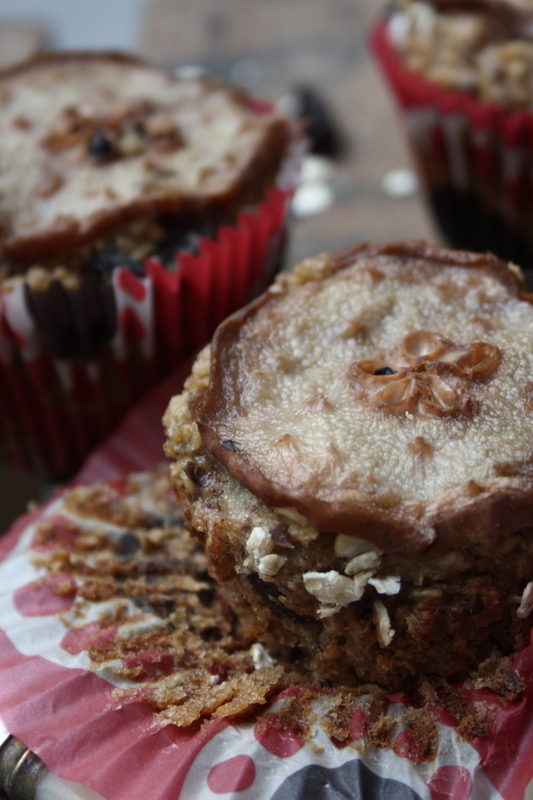 They are like sweet apple and cinnamon porridge in a handy portable muffin disguise. And the oats really do keep you full for longer, it’s true. There is no butter and no sugar in these just olive oil and honey for sweetness. 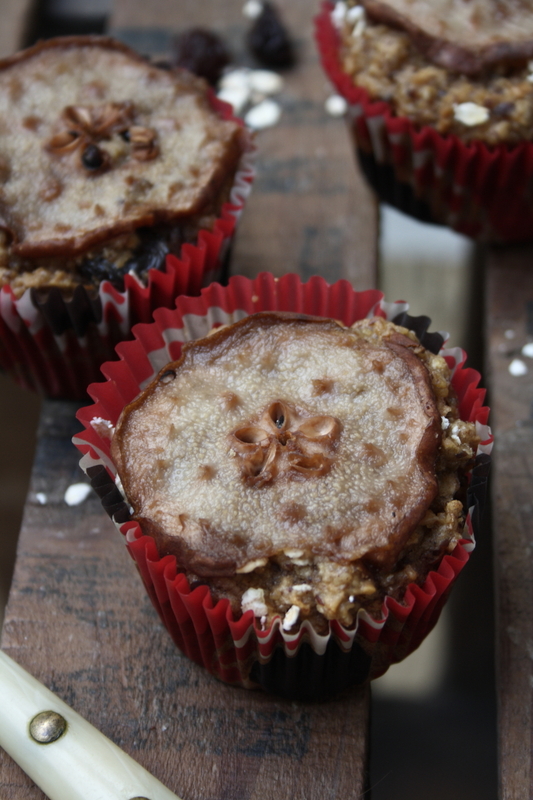 I made them using ground almonds to keep them gluten-free but you could use wholemeal spelt (or normal) flour instead. I adapted the recipe from an amazing website called The Healthy Chef. I have the feeling it won’t be the last time I use one of her recipes if these muffins are anything to go by. Preheat oven to 160 C and line your muffin tin with paper cases. Add the oats, flax meal, raisins, yoghurt, oil, vanilla, baking powder, cinnamon, honey and beaten eggs to a bowl and mix together. Leave to soak for 10 minutes to soften the oats. Then grate in the apple with the skin and any juice up to the pips and mix through. Then add the ground almonds (or flour) and fold in gently. 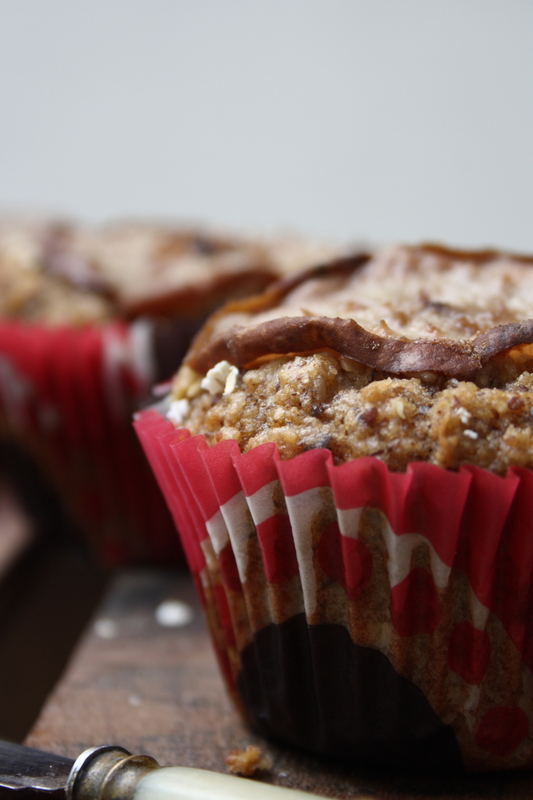 Use an ice cream scoop (or large spoon) to fill the muffin cases then sprinkle over a few oats. 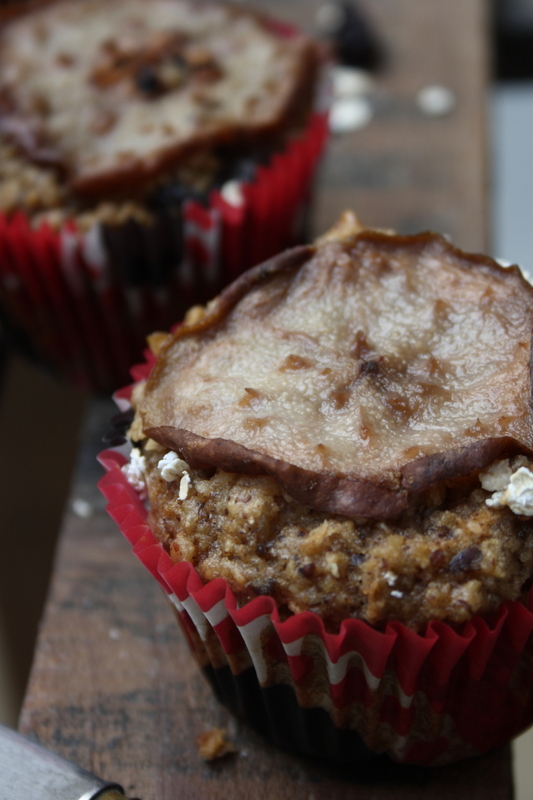 Bake for 15 minutes then slice the pear into thin circles and place one on top of each muffin. Return to the oven for another 20 minutes or until a skewer inserted comes out clean. Brush the tops with a little honey while still warm. Serve warm or at room temperature. Store in an airtight container. 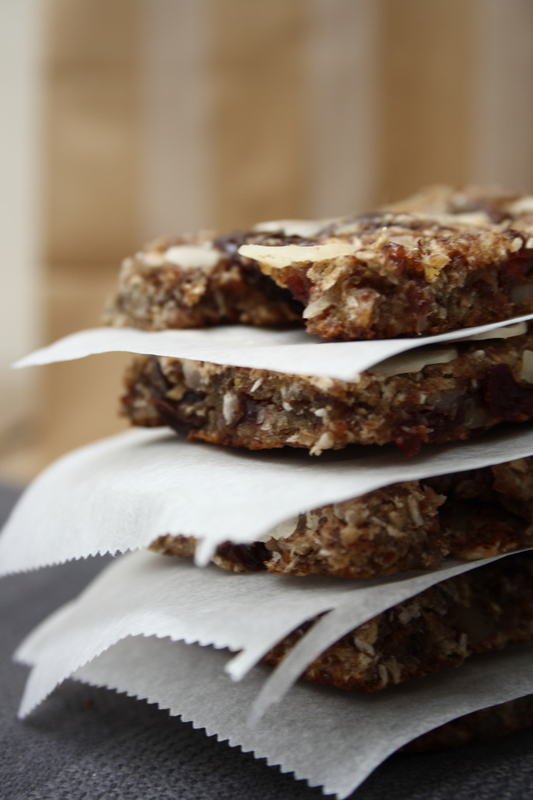 Coming up soon in my Sweet & Healthy series: Chewy Fruit & Nut Muesli Bars and Wholemeal Chocolate Chunk & Hazelnut Cookies. 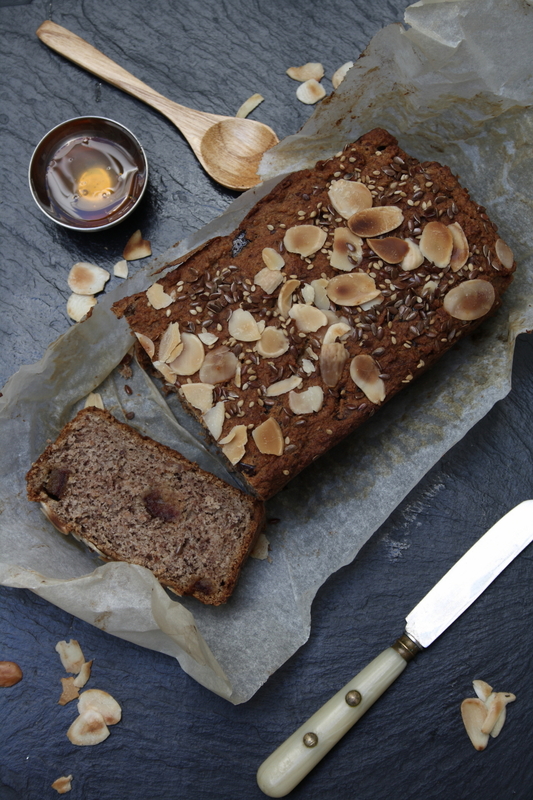 This delicious banana bread is vegan and it also has the virtuous label of no added fats. There is no butter, oils, eggs or refined sugars either. I have added one tablespoon of honey to the whole loaf but you could use agave syrup or leave it out altogether if you like. The sweetness comes from using very ( or even over) ripe bananas and lovely squidgy Medjool dates. 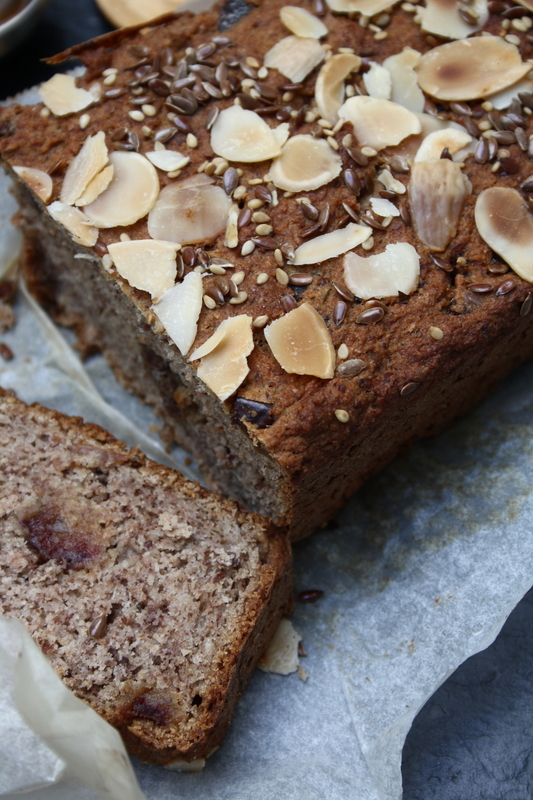 I made it using a combination of wholemeal spelt flour, ground almonds and flaxmeal. This makes it healthy, wheat-free, moist and tasty. You can’t go wrong really. 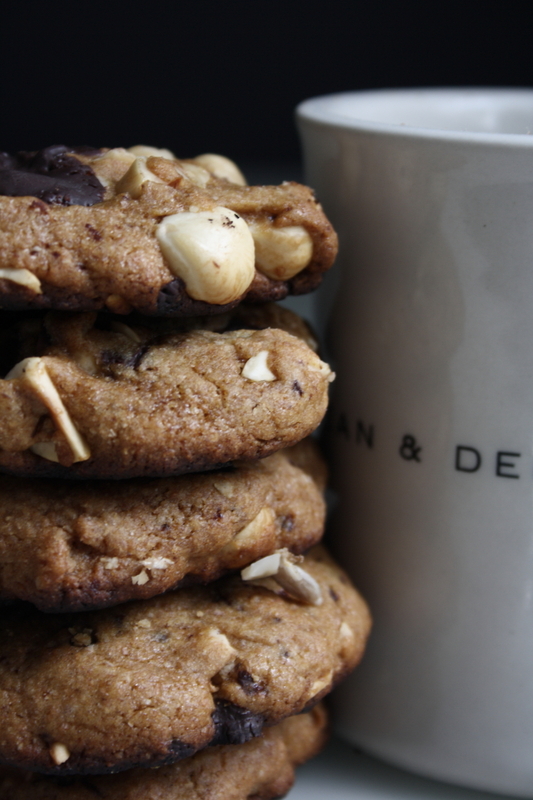 It is perfect for breakfast or to take to work for that mid afternoon pick me up without the guilt. It is lovely toasted and drizzled with a little honey but is just as satisfying as it is. The more mature the bananas (i.e. : blackening) the better, it makes them easier to mash and they taste more sweet and banana-y. Mix the 2 Tbsp flax meal with 6 Tbsp warm water and leave for about 10 minutes until gooey. This is known as flax egg. Preheat the oven to 175 C and line the loaf tin with some baking paper. In a large bowl mix together the flour, 15 g flaxmeal, ground almonds, cinnamon, baking powder, soda and salt. Then stir through the chopped dates. Add in the mashed/blended bananas, the flax egg mixture and the honey/agave syrup if using. Mix together until combined to a stiff dough but don’t over work. Tip this into the lined tin, spread it out evenly and top with some flaked almonds, sesame seeds & flax seeds, if using, and press them down a bit. Bake for about 50 minutes or until a toothpick comes out clean and leave to cool completely before slicing if you can. It is easier to slice when cool. Don’t be alarmed it doesn’t rise much but is delicious all the same. Store in an airtight container or wrapped in a tea towel somewhere cool. Toasting it comes into play if it lasts longer than a few days and has become a little stale. It brings it back to life and is enhanced even more by some of this vanilla apple sauce or honey. 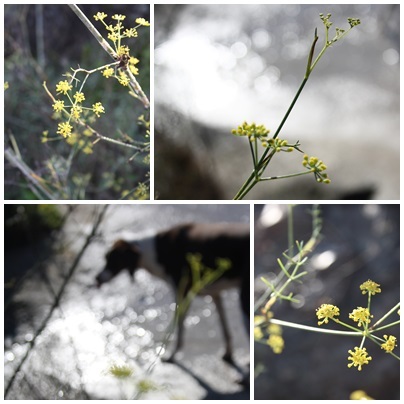 These are some photos I took back in October of the wild fennel flowers that grow alongside the road where I run with the dog in the morning. They’re delicately beautiful. 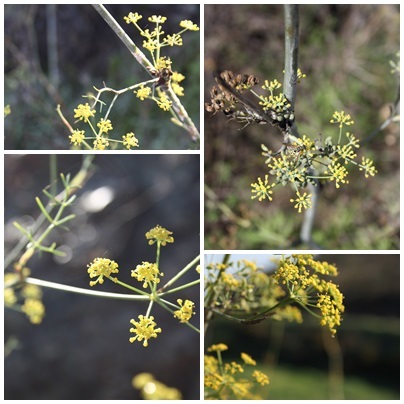 It turns out that one of the major food trends predicted for 2013 is fennel pollen. It is appearing on a lot of the most forward thinking menus used as an ingredient or garnish with fish or as an aroma (by burning the pollen over the finished plate) on many other exciting dishes. Apparently it is quite difficult to get, you can order it online and it is quite expensive. Not here it isn’t, it’s free and growing wild at the side of the road! Rufus even likes to have a sniff as he goes down for a drink in the stream. Hilarious isn’t it. I am definitely researching this more and will be bringing you some recipes featuring “foraged” fennel pollen at the end of the summer! This is my recipe for mince pies and I have to say that, in my opinion, they beat any shop bought ones by a mile. They are better because: number one they contain Amaretto almond liqueur and anything tastes better with Amaretto in it. 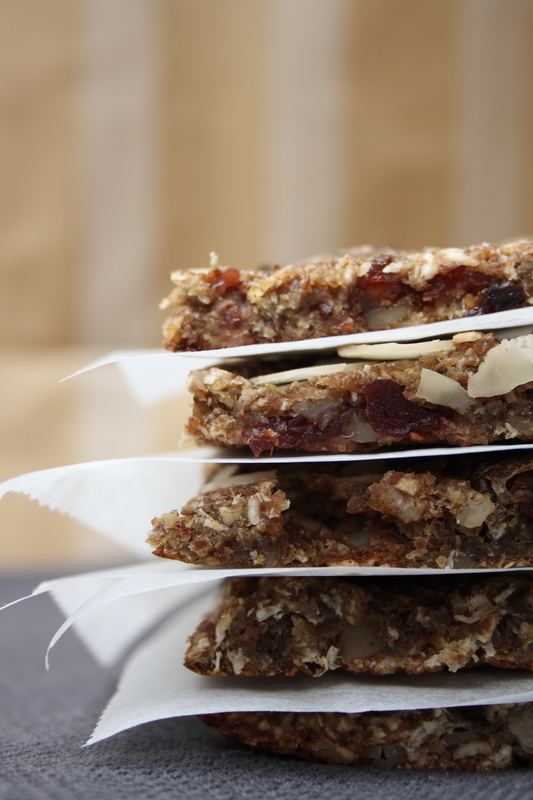 They also contain chopped toasted almonds for a bit of crunch, dried cranberries, mandarin zest and, the special ingredient, crystallised ginger. Make these and you’ll never go back to shop bought I promise. Even if you have an ever-increasing list of things to do…. In the pictures and the recipe below I have used shop bought puff pastry but I have also made a lovely batch with this spelt flour pastry recipe adding a teaspoon of mixed spice to the flour. If you don’t have all the different dried fruits you can just use the more traditional, raisins and sultanas. In a large pan, dissolve the molasses/miel de cana in the sherry over a gentle heat. Then add the dried fruits, crystallised ginger, spices, zest and juice of the mandarin and the Amaretto. Bring to a simmer and cook gently for about 15 minutes until all of the liquid has been absorbed stirring occasionally. You may need to add more amaretto if it is absorbed quickly. Add the almond & vanilla extracts, honey and the nuts. Stir well to combine everything and leave the mixture to cool in a bowl. When the mixture is cool (very important or the pastry won’t work), preheat the oven to 200 degrees and oil & flour your muffin tins. Roll out your first piece of puff pastry to a thickness of 2mm (leave the other piece in the fridge). Cut out 6 circles of about 9 or 10 cm diameter and 6 tops of about 7 cm diameter, you may have to re roll the pastry and may get a few more than 6 if you do. Push the larger circles into the muffin tins and fill each pastry case with a dessertspoonful of the mixture. Brush the edges of the pastry base with a little oil and then top with the smaller circles. Push the edges together to seal. Make a little slit in the top of each with a sharp knife and brush with a little olive oil (or egg wash) and bake for about 15 minutes, until the tops are golden brown and puffy. Keep an eye on them they cook quickly. Leave to cool for a few minutes then take them out of the tin. Leave the tin to cool down completely before rolling out your next batch. Dust with icing sugar just before serving. 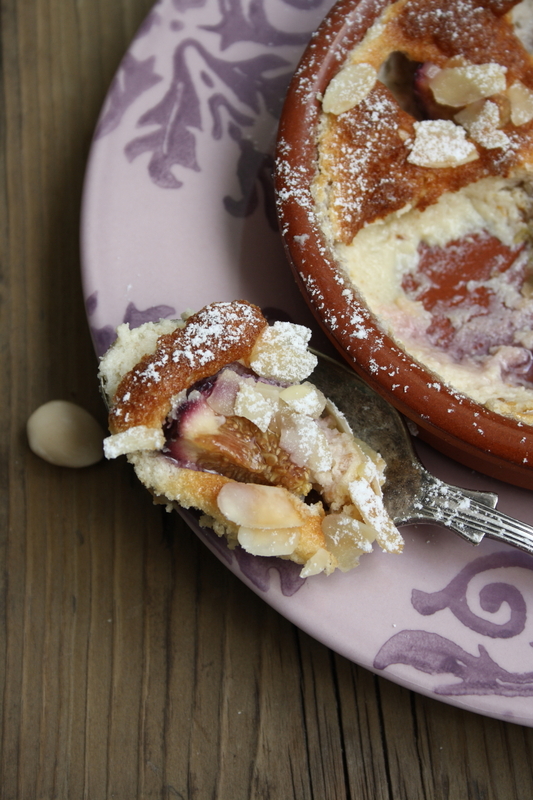 You can serve hot, warm or room temperature with cream, ice cream or a glass of Amaretto on the side…. Merry Christmas! Happy Holidays! Felices Fiestas! The Washer Up has been going on about how wonderful Parkin is for ever. It’s a northern thing you see. As in, from the north of England, specifically the north-west. Yorkshire and Lancashire if you want to be precise. And they will want it to be precise. I am sure there will be comments about its origin and claims that it is definitely from Yorkshire or undenialbly from Lancashire. I’m a soft southerner so I couldn’t give a “monkey’s” as they say down south. So when I saw this recipe for it on one of my favourite food blogs, Kellie’s Food to Glow, this week I was desperate to give it a try. It’s traditionally served on Bonfire night – November 5th, which also happens to be our friend, Jeannes birthday. There was my excuse, as if I needed one. It was enough just to see the smile on his face. Honestly. The Vanilla Apple Sauce that Kellie serves it with is genius. It’s like a vegan custard, a thick vanilla-y custardy apple sauce that we served warm with the hot slices of gingerbread parkin. And a sneaky scoop of vanilla ice cream if you must know. Well it was a birthday dessert. Parkin is traditionally served cold and spread with a little butter according to The Washer Up. Whichever way it is delicious but you have to leave it wrapped up to mature for at least 3 days before you eat it. So be patient and organised for a change because the stickiness you get is really worth the wait. I deviated from Kellie’s recipe slightly by using half coconut oil (not very northern at all!) and half dairy-free margarine because I didn’t have enough margarine. 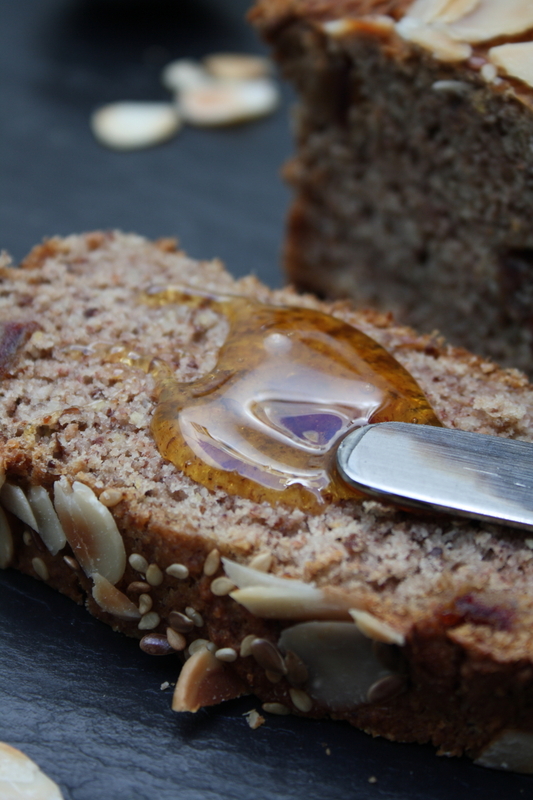 I also used half honey because I didn’t have enough golden syrup and used wholemeal spelt flour instead of plain. It’s a wonder that I managed get anywhere near the original really but this is obviously a very forgiving recipe. No complaints from this end!! Preheat the oven to 140C. Oil and completely line your baking/loaf tin with baking paper. In a large heavy pan, melt the butter (or replacements), treacle, syrup and sugar over a low-ish heat, stirring occasionally until the sugar has dissolved. Mix all the dry ingredients together in a large bowl, make a well in the centre and pour in the melted buttery syrup, stirring together well. Beat together the eggs and milk and pour this in too. Fold all of this through until well incorporated and pour the whole lot into your lined tin. Bake for 90 minutes until a deep golden brown and a skewer inserted comes out clean. Then leave it to cool in the tin on a wire rack. When cool, wrap it up in its baking parchment, then in two layers of foil and leave it in a cool dry place for at least 3 days but up to a week. Good luck with that, I managed 2 1/2 days but it really does get better and stickier and more moist the longer you leave it wrapped up so don’t eat it straight away. It won’t be the same!! Put the apples, water, syrup/honey and vanilla in a pan and cook gently for about 15 mins until the apples are soft then stir in the butter. You can use it as it is, if you like it chunky. Mash it up a bit more or blend it to give it a smoother creamier consistency. 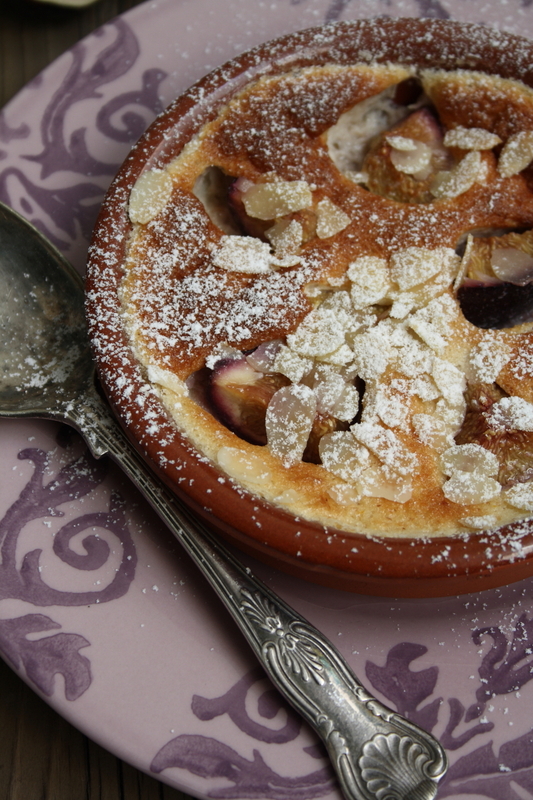 Taste and add more honey, vanilla or a squeeze of lemon juice to tart it up a bit. Serve it warm, or room temperature, with a slice of the parkin. I made these little pastries using the Persian Quince Jam from last post but you could use any jam you like. I have used this lovely fig & honey compote before too which is great if you don’t like using sugary jams. Sambouseks are little samosa-like pastries that are normally savoury and filled with meat or cheese. I made these savoury Fig & Feta Sambouseks before, so this is just a little step in a sweeter direction. The picture below is of the savoury sambouseks and demonstrates the folding technique. Sieve the flour sugar and salt into a large bowl then stir in the fennel seeds. Add the olive oil, mixing it in with a fork then make a well in the middle of the flour and pour in the warm water. With your hand, fold the flour into the water, turning the bowl as you go until you get a sticky dough. Turn it out onto a floured surface and knead until smooth and no longer sticky, 1 or 2 minutes. Wrap in clingfilm and rest in the fridge for at least an hour. Preheat the oven to 180C and line two baking sheets with parchment brushed with a little oil. Flour your work surface and rolling-pin and roll the dough out until it is about 2mm thick. Cut out small circles about 3 inches in diameter (use a floured cutter or a glass). Lift the excess pastry away from the circles and re-roll it and cut out more circles. Keep doing this until you have used most of the dough. You should get 16-20 in total depending on the thickness of your dough. Put the circles on the lined baking tray and, using a teaspoon place a small amount of jam in the centre of the circle and top with a little cheese (if using). Lift up the two opposite edges and seal them above the filling. Seal the two other ends by pinching them together to create a four-cornered sambousek. (See picture above). They can be refrigerated at this point if necessary. Brush the tops of the sambouseks with a little olive oil and bake for 15 -25 minutes until golden and cooked. Leave to cool slightly then brush the tops with honey or agave syrup and dip them in the finely chopped pistachios. Serve the sweet sambouseks warm or at room temperature with a glass of fresh mint tea or Turkish coffee. 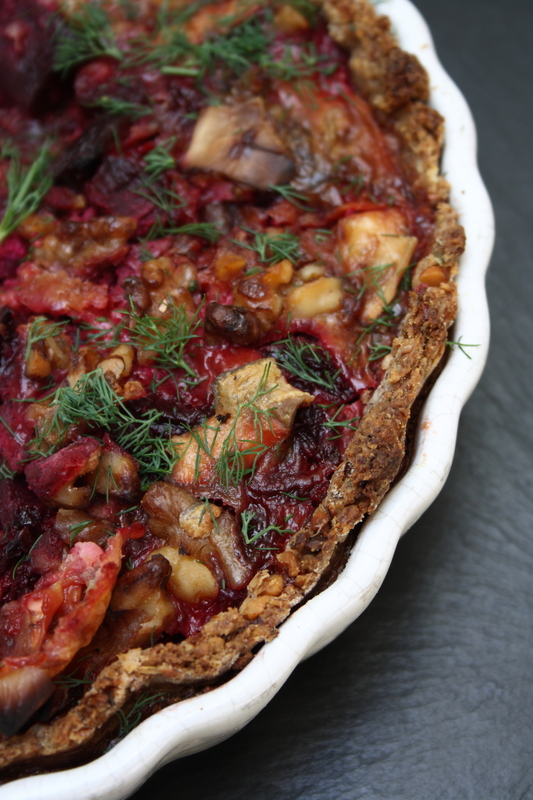 Cook Eat Live Vegetarian is where I share my seasonal vegetarian recipes with the world. I cook, I photograph, and I write about food. It's an obsession. A girl who loves to cook fresh, fun, and global cuisine.